A shul without a chandelier ? "Where do you suppose he gets things like that from ? I'll bet he must hunt them in very strange places" ! WHERE DOES THE TZIG GET THESE THINGS FROM ?! IT'S AMAZING !!!! The title on the picture credit says -in parentheses - Bronspigel. 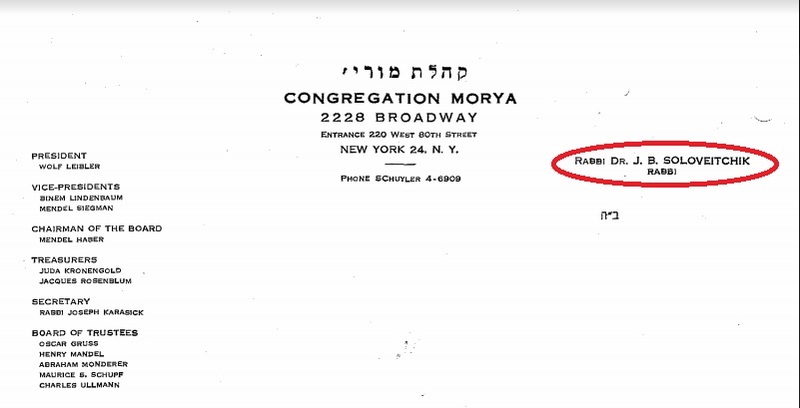 There is a Rabbi Bronspigel who was a Rebbe in YU for many years. I wonder if this title is somehow connected to him (or actually him). Yasher Koach! There is some very important historical info there. I always wondered who started calling the Rov by the irreverent nickname "J.B.". It's assumed by everyone that it's some people within the "yeshivishe velt". 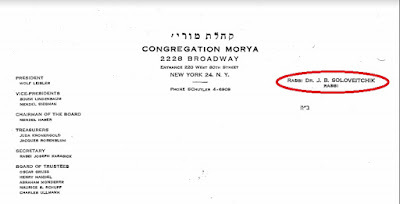 Surprisingly, in the book you brought here, it has testimony from the gabbai of the Moraya shul that it's students of YU who used that nickname when the Rov was still young, and before he became the Rosh Yeshiva. Apparently the yeshiva velt picked it up from them. Those students eventually stopped once the Rov became older and more known and respected, but the yeshiva velt continued. 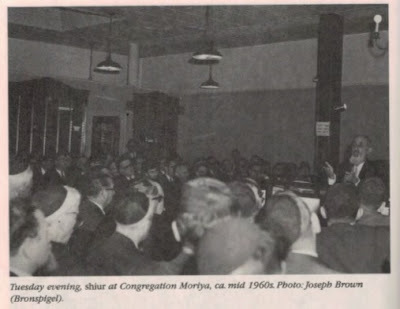 Read with great interest, 45 years ago my uncle took me to a Tuesday night RJBS shiur. Other connections: my father worked for one of the Morya Tuvei Ha"ir, and I dealt with R Czapnick in a matter related to my aunt or uncle's Chelka. He was nice enough, I actually knew his kids, one is now a very successful mechanech in LA. These "Belgian Jews" are represented here as some sort of elite, and perhaps in their mind they were. But lest we forget, the majority of them were of shallow Belgian extraction, most were not born in Belgium , they were of Poilishe , Russishe, or similar European upshtam, just like you and me, just a little wealthier.